In 1966 Gene Roddenberry created an iconic science fiction T.V. series that went on to become one of the most beloved and watched franchises in America. That show was called Star Trek which had numerous spinoffs, T.V. shows, and movies over the past 40 years. In 2009, writers Roberto Orci and Alex Kurtzman, and Lost producer J. J. Abrams rebooted the franchise with an alternate timeline and new actors portraying the roles of the original cast of the USS Enterprise. In 2013, developer Digital Extremes along with publishers Namco Bandai and Paramount released a video game based on the franchise reboot. The game features an all new story that picks up sometime after the events of the movie. After playing this 12+ hour game, several things stood out, some in a good way and others not so much. The story stands out and is heads and shoulders above the quality of the co-op dynamic between Kirk and Spock. There were numerous gameplay issues and everything felt as if the overall game was rushed to meet a deadline and didn’t get that polish it sorely needed. Star Trek’s story was written by Marianne Krawczyk, whose previous works include God of War and Shank. In Star Trek‘s original series, the Gorn make first contact with the federation on Cestus III in the episode titled “Arena.” In this Star Trek game, the Gorn make a triumphant return as the main antagonists to Kirk and Spock. The Enterprise responds to a distress call from a Vulcan science station near New Vulcan, and Kirk and Spock beam aboard to investigate only to find that the scientists have unwittingly unleashed a new menace upon the galaxy. It’s up to the pair and the rest of the Enterprise crew to save the day. Sounds simple enough, kind of like the original T.V. show. The game does a good job of bringing players into the Star Trek universe by allowing them to explore strange new worlds and sending them on an adventure ride they will never forget. Players will boldly go from one firefight to the next as they space walk on Helios station, fight the Gorn on New Vulcan and on the Frontier Starbase, and eventually go on the offensive, taking the fight to a Gorn planet. Kirk and Spock (who seem willing to jump off just about anything) leap off the edge of a cliff on the Gorn planet and out airlocks for corridor flying. There’s even a section where they swim through underwater caverns and run through caves in an attempt to sneak into a Gorn base. If this sounds great, don’t be fooled. Star Trek is one adventure ride that I couldn’t wait to get off. 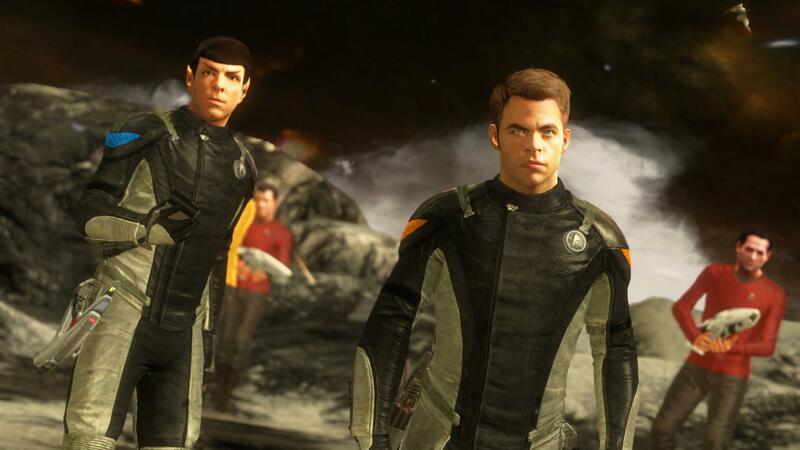 Star Trek The Game features co-op gameplay with Kirk and Spock. Players have to choose between the two at the beginning of the game and can’t switch characters after the choice is made. The co-op is used to open doors, hack computer terminals and revive downed players. Opening doors in the game wouldn’t be so bad if there weren’t so many of them that Kirk and Spock have to force open together. Using the turbo lift is a pain because the AI controlled partner runs in circles trying to get in. The hacking mini games consist of matching different frequencies to get past an obstacle. This applies to co-op and solo hacking efforts. The worse part of the co-op is having to listen to Kirk constantly whine about every little thing. The dialogue between the two wasn’t bad when they focused on the story, but every other conversation consisted of Spock complimenting Kirk on his accuracy, Kirk complimenting Spock on his knowledge and Kirk’s consistent whining and bad jokes. It starts to wear thin after a while but it never stops. At one point, I wanted to kick Chris Pine out of the game and bring William Shatner back. At least those long dramatic pauses were entertaining. I played as Kirk throughout the campaign. At one point Spock got caught in the geometry and I had to go on without him. Between that and the AI not killing anything, I was better off on my own. I’ve played co-op games where your AI partner would not help you if you went down, but at least that’s not the case here. If Kirk goes down, Spock is right there to help him up and vice-versa. The only time the AI partner goes down is if the player places them in the line of fire. I know the term gameplay issues is vague, but to be honest, that’s the best way to describe the numerous problems. Star Trek the game has a lot of bugs. There are clipping issues when Kirk and Spock work together to open doors. 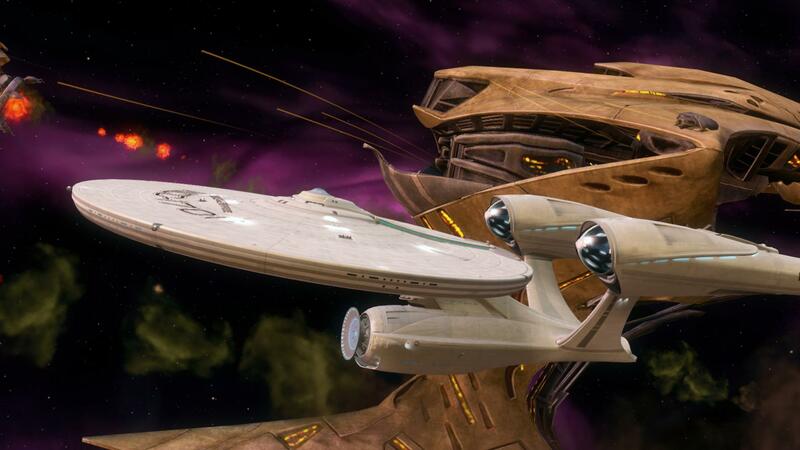 Scene transition issues occur when the duo return to the Enterprise at the beginning of the game. They are wearing their space suits and instantly change back into their Star Fleet uniforms. This isn’t one of those fade to black moments either. There are two more instances involving the Gorn that are just as jarring. I even ran into enemies that wouldn’t die and a stealth section that forced me to restart at the checkpoint when I reached a certain area. During the game, I didn’t have too many problems figuring out where to go and what to do. All I had to do was follow the tricorder waypoint. That wasn’t the case with space combat. It started out fun but quickly turned sour as I couldn’t figure out what I was supposed to be doing. I fired phasers and torpedoes at the Gorn and died anyway. I fought as hard as I could for as long as I could, inching my way past checkpoints until it was finally over. I never thought that something as simple as moving a targeting reticule around the screen could be so difficult and complicated. The producers of Star Trek The Game were smart enough to secure the voices and likeness of the movie actors giving greater legitimacy to the game. The voice work turned out to be fine; all the actors did an excellent job in reprising their roles. The only issue I had was that there was a little too much banter between Kirk and Spock. It was nice to be able to talk to Sulu, Chekov, Scotty, Uhura and Bones and they each had a good chunk of dialogue to help push the story but it just wasn’t enough. Modeling video game characters after real life people is a challenge unto itself. The character models looked good from a certain direction as long as they were not moving. Spock often looked like he had a broken nose and the characters mouths didn’t always move with the dialogue. In the Star Trek universe, the Tricorder is an integral piece of equipment. 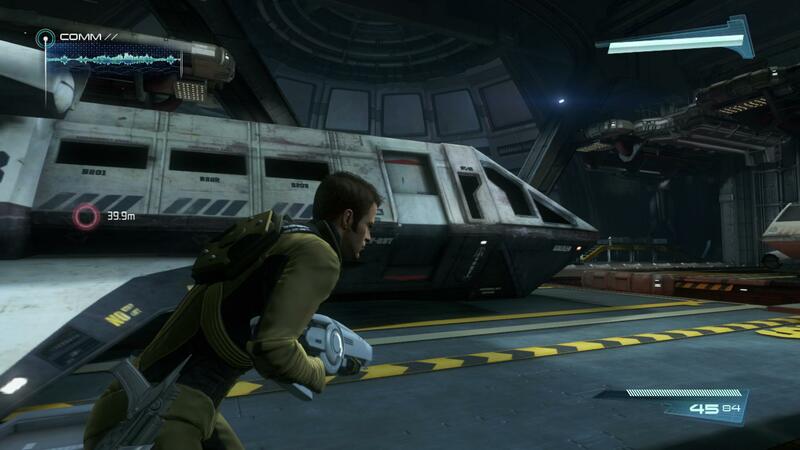 In Star Trek The Game, the tricorder is used to scan objects of interest similar to the scan visor in Metroid Prime. Players can use the tricorder to scan the different Gorn species, Gorn weapons and other items throughout the game, which awards experience points when used. 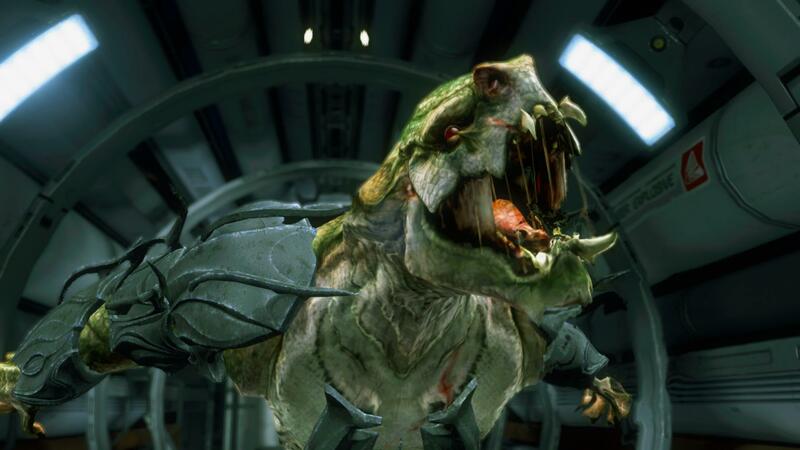 There are different Gorn species the player will come across during the game. The only thing that stands out about them is their tail when they take cover. Each species uses a different weapon but they are just alien variations of the sniper rifle, shotgun, assault rifle and heavy machine gun. Like the Gorn wielding them, none stands out as unique. There is an experience point system used in the game to upgrade the phasers stun and kill abilities along with tricorder electronic and support functions. Unfortunately it’s easy to miss items that can be scanned considering the amount of time the tricorder is used to open doors, hack gun turrets and terminals. The main problem with Star Trek The Game is that it had to be released to coincide with the release of the second movie, Star Trek: Into Darkness. It’s safe to say the game was rushed. This is the problem with most movie tie-in games. The game unfortunately didn’t get that extra time for bug fixes and polish. Space combat was too tricky to figure out and just failed to capture the moment. The transitions between scenes were bad and the abundance of compliments between Kirk and Spock were too much. I understand that time constraints forced the game to be linear and it was written as if it were an adventure movie, but unfortunately the game needed more than that. There were a few things that stood out. The character dialogue was great and the the models looked better when they were standing still. The story was good and the game took the player on an adventure with Captain Kirk and Mr. Spock. The game had potential, but the fact that it was rushed completely ruined the magic. Chris played Star trek on the normal difficulty setting and took 13 hours to finish. He was not provided with a copy of the game for review purposes. + The voice work was great. + Character models were good when they were not moving. + Some of the dialogue between Kirk and Spock. -The rest of the dialogue between Kirk and Spock. -The constant need for Kirk and Spock to compliment each other.